I've always thought Torpedo was cool even though I never had much interest in the original figure. I never had him as a kid, so I was always more of a Wet-Suit fan. 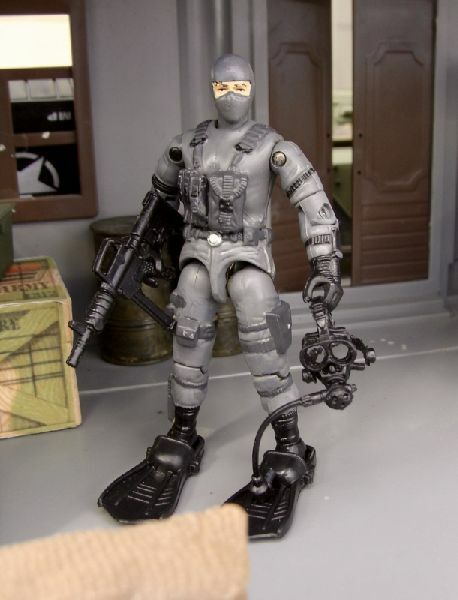 We only ever received one Torpedo figure during the ARAH run, which is a shame. As I look at him and all the Torpedo figures released since, there isn't one that I particularly like (though the 04 Chief Torpedo comes close). This may be why I enjoy customizing this character so much. This version was inspired by the cover to the original GI Joe Special Missions #1, and despite many parts being anachronistic, he was designed to fit in with the '86 series of figures. The only real mods to the figure was the Dr. Mindbender torso, which had the Cobra insignia filed off the back, and pouches added to the chest. 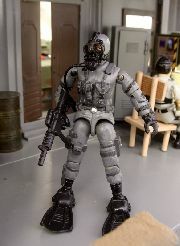 This was actually done previously for a Wreckage custom that has since been disassembled with parts being re-purposed.